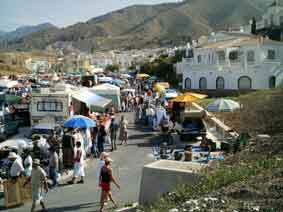 The Nerja Sunday Market/Flea Market/Car Boot Sale/Rastro, call it what you will, is located near urbanisation Almijara II - see Maps & Directory section - Places of Interest. 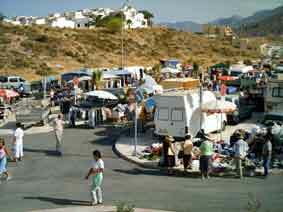 The market usually gets going between 08:30 and 09:00 and everyone starts packing up at around 14:00. 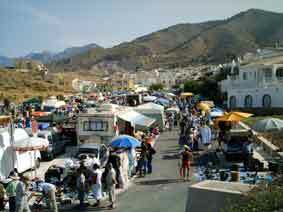 The market 'Rastrillo' is signposted from the centre of town. It is quite an uphill hike from the centre of town, 20 to 30 minutes, but there are alternatives: bus, car or taxi. By car, heading from the town along calle San Miguel in the direction of Maro, turn left at the Burriana roundabout (exit 3) into calle Julio Romero. The road bears right and then about 250 metres further up on the left is a turning (calle Cisne) to Almijara II and the market. The local 'Blue Bus' stops near the market. The 'Blue Bus' starts from the Hotel Monica in avenida Mediterraneo and follows the route: calle Chaparil, calle Antonio Ferrandis 'Chanquete', calle San Miguel, avenida de Pescia, calle Julio Romero, calle Cisne. There are several regular bus stops along the way.